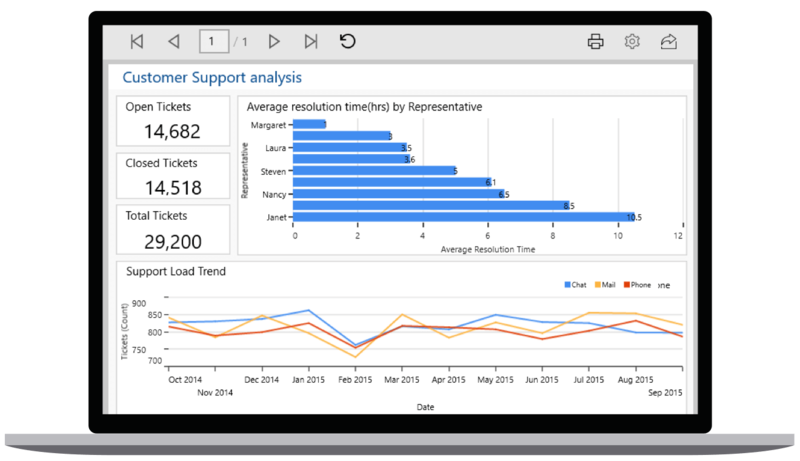 The UWP Report Viewer is a .NET reporting tool that displays SSRS, RDL, and RDLC reports within UWP applications. The UWP Report Viewer provides an optimal user experience across phone, tablet, and desktop form-factors. The UWP Report Viewer is a .NET reporting tool that displays SSRS, RDL, and RDLC reports within UWP applications. It empowers your application with all major capabilities of RDL reporting such as parameters, variables, expressions, code modules, calculated fields, sorting, grouping, filtering, paging, report linking, drill through, hyperlink and more. You can export the report to PDF, Excel, CSV, Word, PowerPoint, and HTML formats. The UWP Report Viewer provides an optimal user experience across phone, tablet, and desktop form-factors. Syncfusion UWP Report Viewer can render RDL reports published or deployed on SQL Server Reporting Services (SSRS) server and view RDL/RDLC reports that are local or embedded in an application without using SSRS Report Server. Retrieves data from a wide variety of data sources that are in local or server data bases. Built-in data sources: Microsoft SQL Server, Microsoft SQL Azure, SQL CE, XML, Microsoft Access, Oracle, OLEDB, and ODBC. Business object data source: IList, DataSet, and DataTable. Custom data processing extension: MySQL, SQLite, PostgreSQL, etc. Basic items: Text box, image, line, and rectangle. Data region items: Table, matrix (pivot table) and list. Data visualization: Charts, sparklines, data bars, gauges, indicators, and maps. End users can interactively provide report parameter inputs at run-time to modify data presentation of reports based on it. Report Viewer supports SQL RDL reporting’s extremely powerful interactive features (drill through and hyperlink) that display data and information in detail. Renders reports with simple and complex SQL Server Reporting RDL specification expressions that specify or calculate values for report item properties, parameters, queries, groups, sorting, code module, filters, fields, collections, functions, etc. Export displayed reports into popular file formats such as PDF, Word, Excel, CSV, PowerPoint, and HTML.